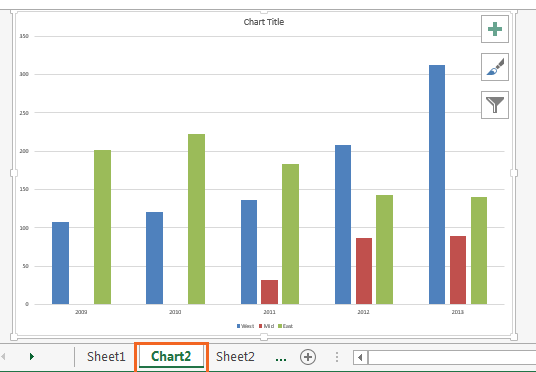 In this article, I shall discuss on how Excel handle charts, what is embedded chart and chart sheets. Before we start creating an Excel chart, we need data. No data, no chart. The data must be stored in the cells of a worksheet. 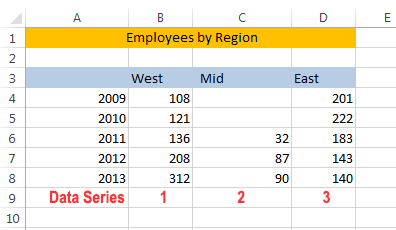 Imagine a hypothetical company “XYZ” and it has recorded its employees in West, Mid and East zone from the year 2009 to 2013 like the following figure. Employee data of a hypothetical company. Click any cell within the range of the data. Choose Insert ➪ Charts ➪ Recommended Charts. Insert Chart dialog box appears. Choose Line chart from the Recommended Chart tab. 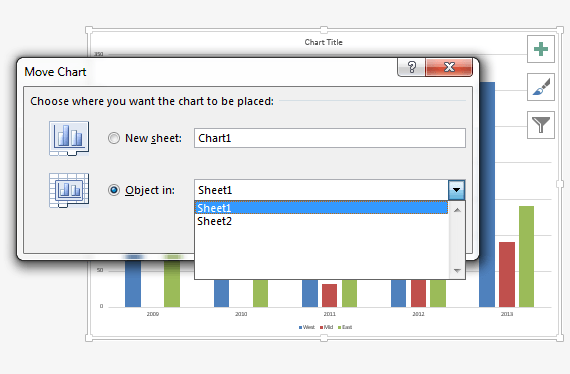 And finally, click OK. Insert Chart dialog box vanishes and you will get a chart like the following figure. This line chart is created from the data. Green, Blue, and Red lines are representing three data series. The look of the data series depends on the selected chart type. 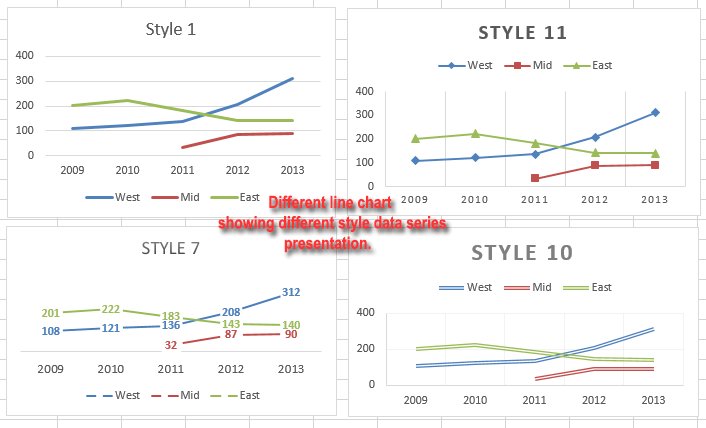 To change the style of the data series, just activate the chart, select Design Tab, and select the style you like from the Chart Styles. You can select different chart styles. I have selected some different styles for my above chart. Generally, the data you are using to create a chart resides in a worksheet. But this is not a mandatory requirement. A chart can be created with data that are stored in a different worksheet or even the data may be in another workbook. A very important point to keep in mind is that charts are dynamic. It means that whenever you change any part of the data, the chart is automatically updated to reflect those changes. 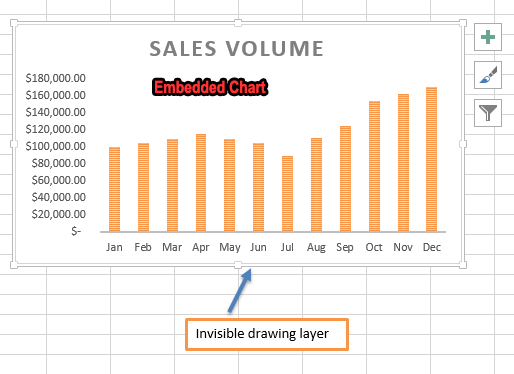 Excel 2013 provides an easy way to change anything of a chart. Just activate any chart and you will find three icons to the right of the chart. Hover the mouse over any of the three icons, it will display its name with a short description. Using these three icons, you can change anything of the chart. I shall discuss in details about these three icons and their uses later in this chapter. Maximum time a chart is embedded (attached) in a worksheet. But a chart also can be displayed in a separate chart sheet. Chart sheet is just like worksheet, I shall discuss about it in this article. You can easily move an embedded chart to a chart sheet and a chart sheet can be made an embedded chart. Read More: How to Make a Control Chart with Excel VBA! So far whatever charts we have made all are embedded charts. It just floats on the top of a worksheet. There is an invisible drawing layer on a worksheet. Embedded charts are displayed on that drawing layer. The Invisible Drawing Layer is holding a chart. To make any changes in an embedded chart, just activate the chart clicking on it. 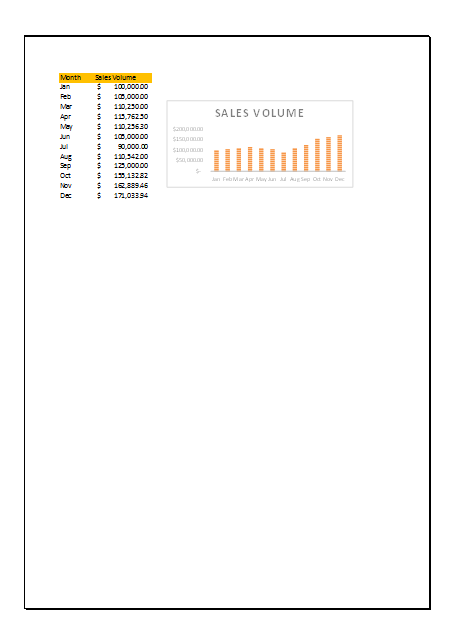 When it is activated, Excel shows the CHART TOOLS contextual tab. By default DESIGN tab is selected, but there is another tab named FORMAT. Using these two tabs, you can do any changes in the embedded chart. A chart formatted using the FORMAT tools like Shape Styles, WordArt Styles. Print Preview of a worksheet that holds an embedded chart. Whenever you create a chart, it is made as an embedded chart. But if you press F11 after selecting a cell within the data, a default chart will be created on a chart sheet. A Chart Sheet is like a worksheet. The difference is a worksheet holds both data and chart but a chart sheet only holds a chart. Worksheets are named as Sheet1, Sheet2, and so on. Chart sheets are named as Chart1, Chart2 and so on. One chart sheet can hold only on chart. A Chart sheet is holding a chart. The embedded chart will be open in a new chart sheet. The Move Chart Dialog box. Click the chart on the chart sheet that you want to move to a worksheet to make it an embedded chart. There is a drop-down list on right of Object in, choose the sheet where you want to embed this chart. The chart will be embedded in the selected sheet and Chart sheet will be vanished. The Move Chart dialog box used to move chart from the chart sheet. Printing a specific chart is easy as a chart occupies the whole chart sheet. You can easily then print the chart by itself. Locating particular chart becomes easy as every chart sheet has its unique name to identify them. When a chart sheet is active, Excel Ribbon shows the CHART TOOLS contextual tab like when you activate an embedded chart. You can change the chart on the chart sheet using the tools available in this tab. Use the scroll bars to scroll the chart if the chart is too large to visualize. Or you can use zoom factor to minimize or maximize the chart. Chart orientation(Landscape/ Portrait) can be changed choosing this command: Page Layout ➪ Page Setup ➪ Orientation. Download the following file to practice by yourself. So, this was all from me on this topic. Let me know in case you face any issues while using this article. 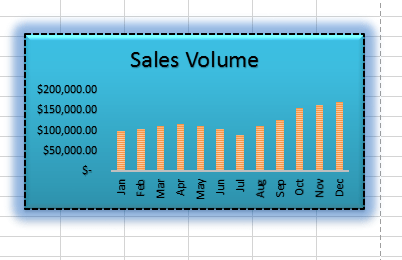 This is just starting of basic charting in Excel. I shall dig until I can make you expert on charting. Keep in touch. Thank you for reading.